A document has surfaced that may be a detailed feature overview for the next Xbox as well as a road map for future updates. On 56 pages, the document – marked “confidential – for discussion purposes only” – details the next generation of Kinect, as well as AR goggles that allow the game to take place all around the living room. Scribd. It appears that the document dates back to 2010. It has since been removed from the website, apparently at the request of a law firm working for Microsoft. The next Xbox, according to the document, would ship with a Blu-ray drive and a new version of Kinect. The latter would be only a marginal evolution of the current technology. The console would launch in 2013 for $299. Key hardware features would be “licensable architecture (both for incoming and outgoing licensing)” and “support for alternate form factors / devices with different total system feature set”, which might mean that other hardware manufacturers like Dell or Samsung may build their own Xbox compatible console or include the hardware in other devices like television sets, much like the 3DO back in the day. Yet another feature would be a “modular design to facilitate SKU updates later in lifecycle”. Such a console could be expanded in the same way the N64 had an expansion slot for more memory. In fact, the document describes the idea that such a modular design, coupled with the launch of a cloud solution in 2015, would make successor consoles obsolete. You would “never need to upgrade hardware again.” Confusing in this context are remarks about a proposed 10 year life cycle for the console. 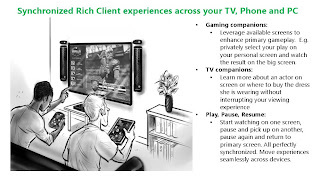 In 2012, a “new haptic controller” is set to launch for Xbox360 so users can “control your TV experiences via gesture, voice and touch.” But for the next Xbox, Microsoft seems to have a real controller revolution in store. 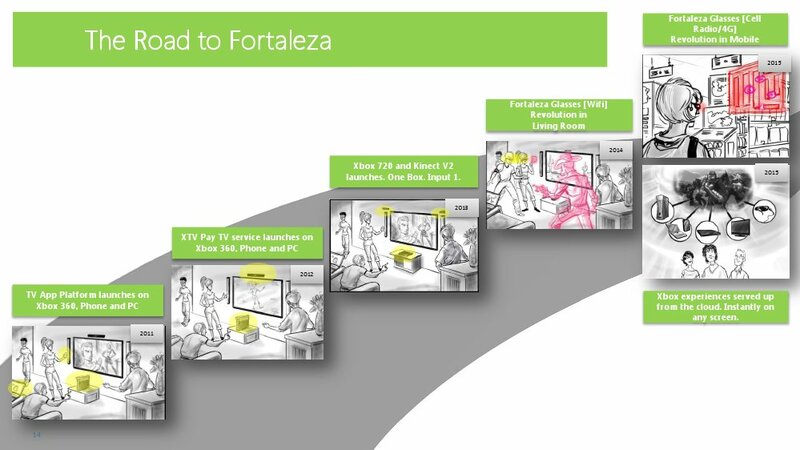 The document describes augmented reality glasses, dubbed “Kinect Glasses” or “Fortaleza” after a Microsoft Innovation Center near that location in Brazil. These glasses would probably be comparable to Google’s Project Glass and launch in 2014, one year after the new console. 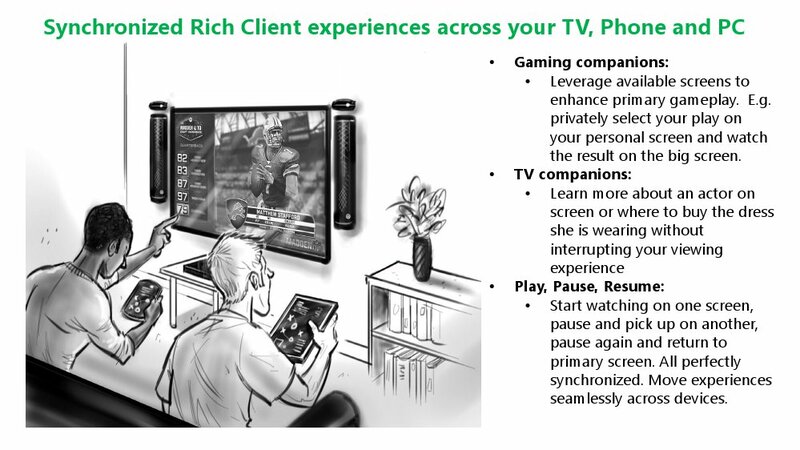 These glasses would not be a mere Xbox peripheral but a device in its own right that would feature Xbox compatibility. Baffling is the reference to “9/24” in both the file name (“XBox-720-9-24-Checkpoint-Draft-1”) and a headline (“9/24 Agenda”). It is a fair assumption that it refers to the date September 24th. But it is not clear which year is meant, nor what event would have taken place at that date or, indeed, will. So much for the details. Let us now consider the authenticity of the document. There are a number of options here. Firstly, the document may constitute Microsoft’s genuine plan for its next console in every detail. In this case, the ideas detailed here would all still be valid and could be expected. Then again, it might be a complete fake, rendering all the information useless. There are a number of options in between, though. As a cynic, the leak might have been deliberate to steal Nintendo's Wii U thunder. This is not likely, but still a possibility to consider. Alternatively, the document might have been only one of a larger number of papers with ideas for the next Xbox that were meant for nothing more than a brainstorming session. As such, they might contain some authentic information, but would consist largely of one of many engineers’ ideas of where a new Microsoft console might go. The disclaimer found on the document (“for discussion purposes only”), as well as the somewhat sketchy drawings may support this theory. 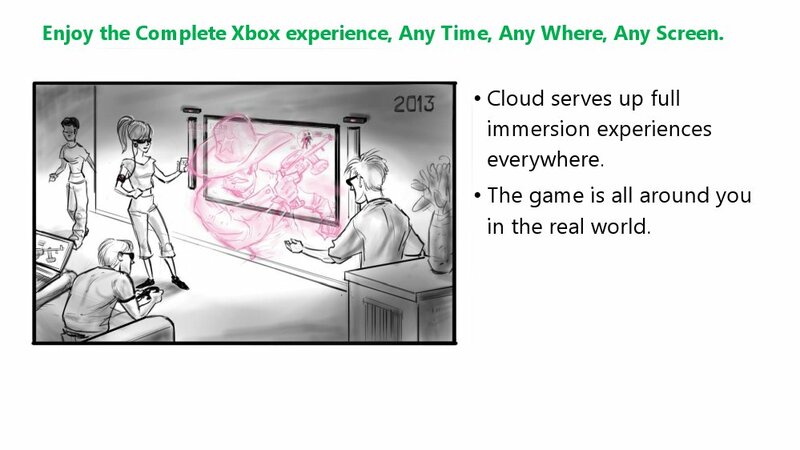 Also, the document begins by mapping out a methodology, whereby a tentpole idea such as “Kinect, cloud rendering, glasses” leads to various signature experiences on behalf of the user, each requiring hardware, content and an adequate platform. Outlining such a methodology suggests a more academic and perhaps more hypothetical approach. As far as the actual content is concerned, there is nothing I find totally unrealistic. The Kinect glasses are a very ambitious project and I am unsure whether such a product (by Google, Microsoft or anyone else) would be ready within the next few years. Also, I doubt that Microsoft will be able to launch a new console in 2013. The regular cycle was to introduce a home console in one year and launch it in the year after. But these are marginal disagreements. Altogether, the sheer volume of 56 pages would make this a very elaborate fake, if it were one. The images and overall layout appear to me too good for a fake but not good enough for a final presentation. The document is a draft, after all, as the file name suggests. So I do believe the document is real but I am sure it was used in only one of a number of presentations that were largely hypothetical. So we should not treat its details as something Microsoft is actually planning to bring to market but rather as something that was considered at one point but might never make it to store shelves. The funny thing is that the Wii U doesn't have any "thunder" to steal right now. Hopefully the nearly confirmed summer conference will be a time where they show more games. All the Wii U really needs at launch is another really good first party game and CODBLOPS2 and it would be a pretty good launch lineup, even with just the games shown at E3. All theDiablo 3 items Nintendo wii console You definitely requirements at start is an additional fabulous initial bash online game and also CODBLOPS2 also it will be a excellent launchCheapest wow gold lineup, despite just the game titles proven in E3. The clothing we know today as trousers is one of the most prevalent types of garments about the globe. The truth is, trousers, also identified pants, slacks and breeches, are one particular with the oldest types of clothing within the history of mankind. Big benefits for Diablo 3 players in Diabloiiigold, more coupon code for D3 Gold will help you save more money and time to enjoy the game.As usual,we are glad to provide you cheap and fast Diablo 3 Gold service.